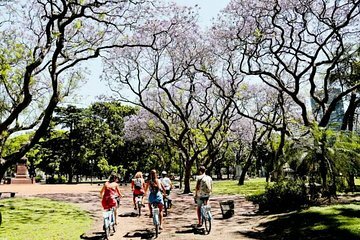 Discover the green side of Buenos Aires on this 5-hour bike tour of the city’s parks and plazas. Pedal along the shaded forest trails of the Palermo Woods and the Botanical Gardens, stopping to admire the colorful Rose Garden and take a peek at the city zoo. Then, cycle between the quiet streets of Recoleta and the lively shops and plazas of Palermo Soho. Stop off along the way to munch empanadas, sip yerba mate and snap photos of landmarks like the Metal Flower, Recoleta Cemetery and the Spanish Monument.